As far as I am able to determine, no one has built a model wood splitter. 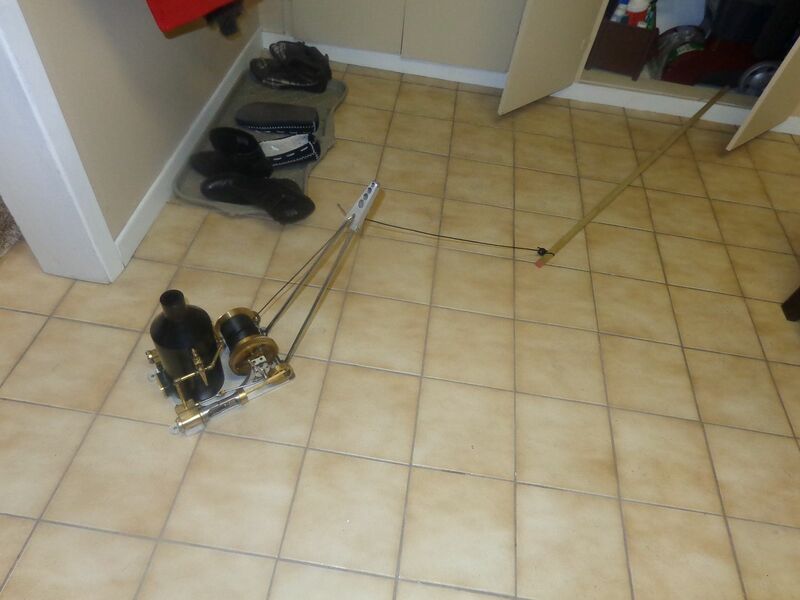 A google search on wood splitters show two main types, either hydraulic (which are not suitable for a model, in my opinion), and electric screw type which might hold some promise. Then of course there is the cone shaped threaded splitter which bolts to a tractor wheel and screws itself into a block of wood, bursting it to split it, and the heavy revolving flywheel with an axe head mounted on it, which looks like a total suicide machine. I have seen one example of a steam driven wood splitter, which worked well, but I doubt that it would scale down very well. Model engines simply don't have much torque. 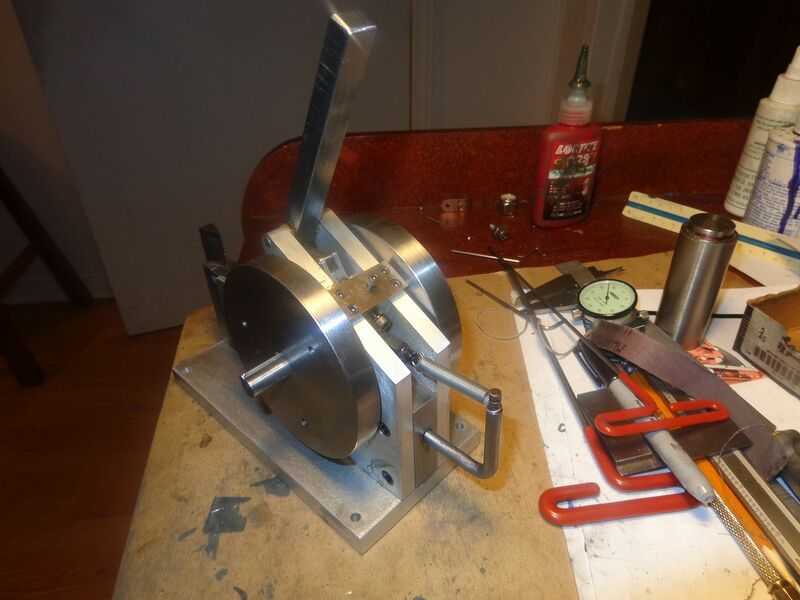 One of the primary things that a model woodsplitter would need would be a huge torque multiplier, and with torque multiplication, things slow down dramatically. 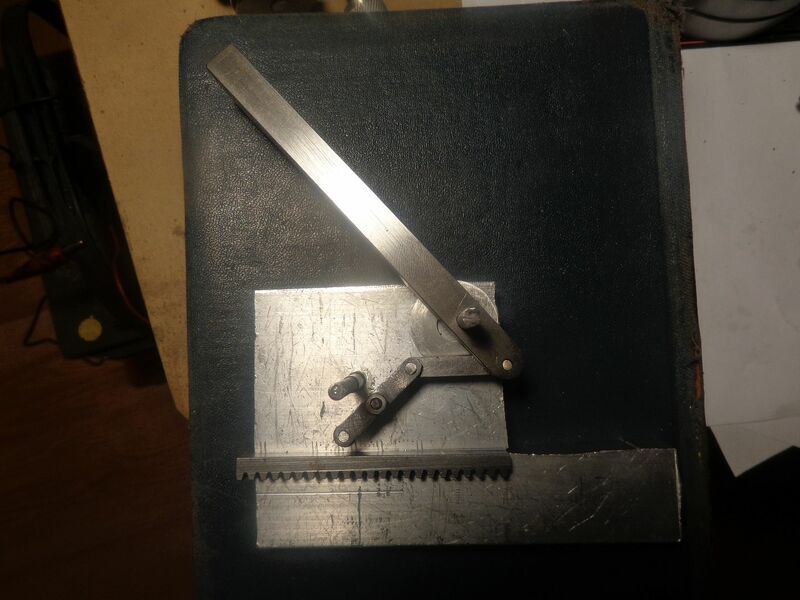 I have a couple of ideas floating around in my head, one involving a rack which is pushed forward incrementally by a sprag driven from an eccentric, and one which had a heavy flywheel with an eccentric on both sides driving "pusher arms".I want to split wooden logs 1 1/2" long, and prefer to split them in one full movement of the splitter, not incremental units. Of course, the wood splitting action would have to be controlled by a hand lever mechanism, so it would only split "on demand", and then only one cycle. Nobody wants a finger chopped off while removing the split piece of wood and putting a new piece on the splitter. Brian, although it won't do it in one blow have you thought of the type that work a bit like a slide hammer. Lift a weight up and let it drop onto the wedge, repeat until the log is split. Should be quite simple to lift the weight to the top of a guide and have the drive let go so it drops then picks it up again. 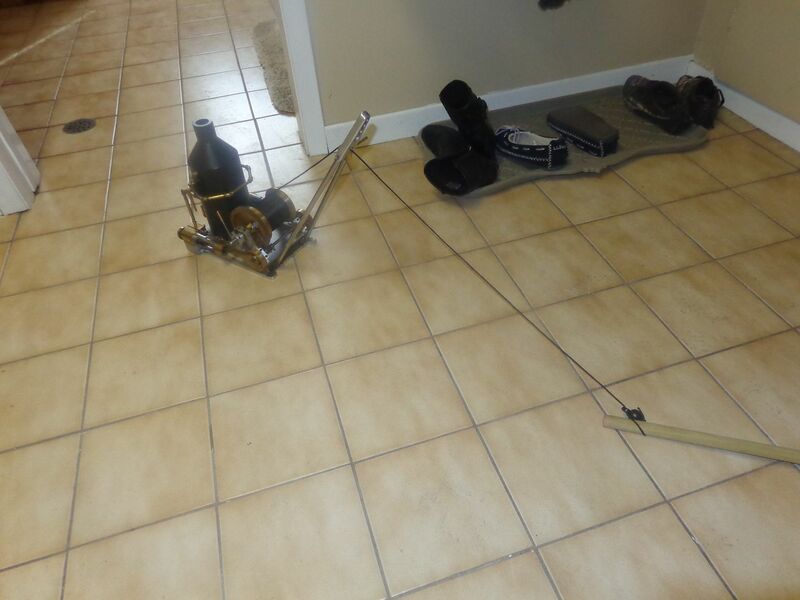 You could change the wedge to a solid block and use it to drive mini fence posts too. Marv--That is the one I called a "Total suicide machine". The first one of those I seen in real life was a home made one in Juneau, Alaska, and I thought "Oh My God'--somebodies going to lose a hand!!" Jason, I am hoping to do it all in one blow. 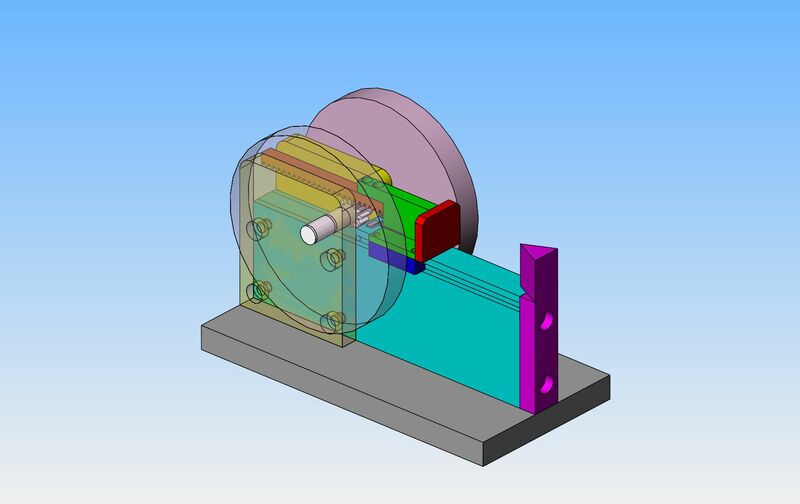 I have been setting designing in my head for two hours, and have decided that even though model engines don't have a lot of torque, they can spin a massive flywheel, and generate tremendous inertia. If one can then gear down the rpm of that big flywheel and use a dog clutch to engage/disengage an eccentric with pusher arms, that will work, and yes, I'm pretty sure that it can be set up to "go home" after each cycle and wait to be activated again. 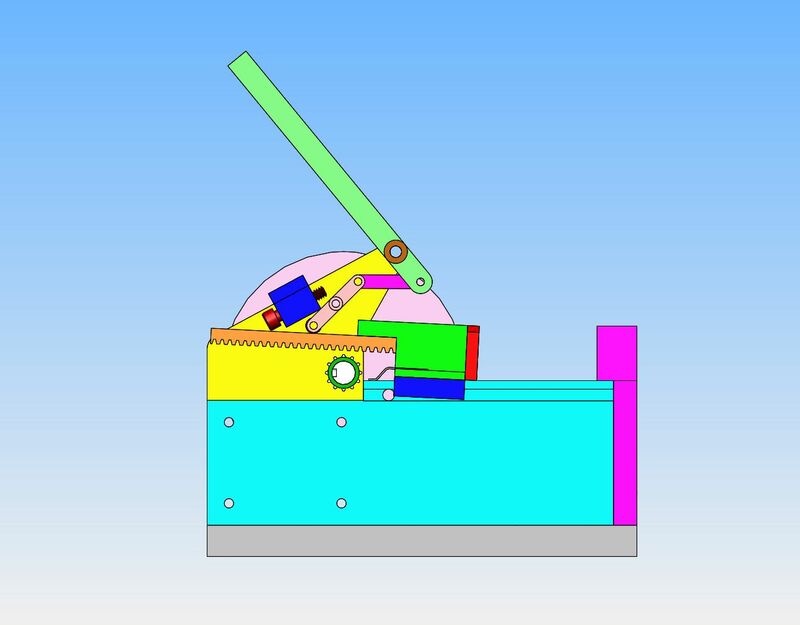 The dog clutch is something I haven't designed before, and as an added attraction, the mechanism is going to have to disengage the dog clutch automatically and return the handle to the disengaged position after each cycle. 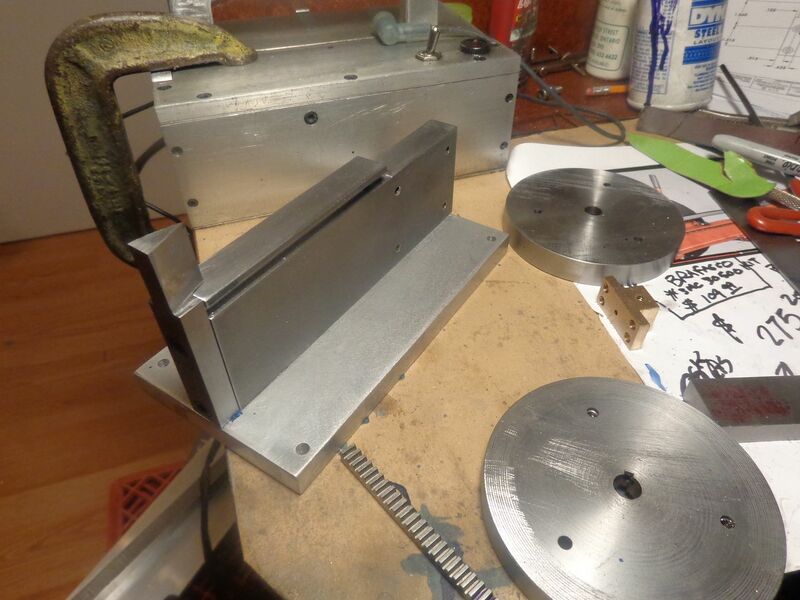 Brian, so this would be sort of like a die stamping press in a way only horizontal rather than vertical ? I think you may be on to something with the dog clutch! Okay--I've got the easy part sussed out. The flywheel and supports are going to be easy too. The Devil be in gearing down the flywheel to a reasonable output rpm and figuring out the dog clutch. And just for a sense of scale, the round part behind the splitter wedge is 3/4" diameter, mounted in a 1" wide plate. Maybe we're going to rethink this a little. I have a 3" length of 24 DP rack left over from my sawmill. 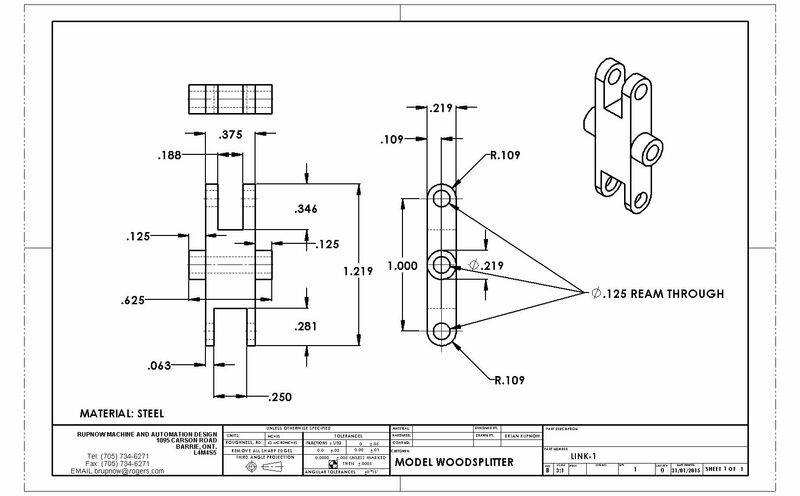 The "wood" I want to split is only 1 1/2" to 2" long. I found a video on the internet that is so simple I think I will try to copy it. If you look at the diameter of the pinion in the video, it is much smaller in relationship to the rack than I am able to approach. The smallest gear I can cut is a 12 tooth, which has about a 1/2" pitch diameter. I will have to do some experimenting and see if this will drive the ram too fast or not. Although it would be less hassle if it doesn't, it's not a deal breaker because I can slip a gear reduction in between the flywheels and the pinion shaft. I have a set of 3 7/8" diameter x 1/2" thick steel flywheels that I have been saving for a project, and I think they would be just about perfect for this. Here we have the new version in retracted and extended positions. 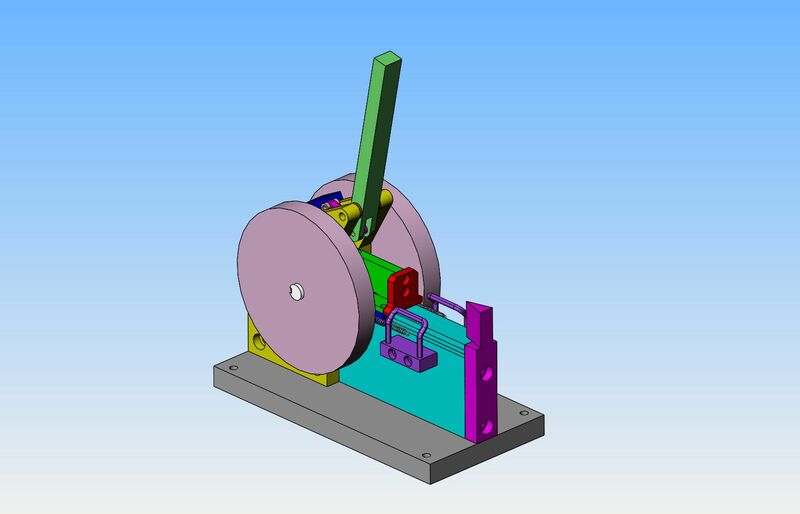 I haven't designed the mechanism which holds down the rack in contact with the gear yet---I will do that this afternoon. those flywheels are 3 7/8" diameter. It will take a piece of wood 1.9" long. Brian, I notice that the included angle (of the splitting wedge) on the one shown in the video is much smaller than you show in your drawing. I would think that could make a substantial difference in the energy required...perhaps not a factor in a model but was curious as to what you based your wedge angle on? Bill--More than anything, it was a guess. This will be "trial by fire".--If the angle is too great, walk the part over to the mill or grinder and knock it down a bit. If it's okay, then leave it alone. You're right--it does look pretty abrupt. These will make perfect "hold down" bearings to ride against the back of the rack to keep it engaged with the pinion. They are router follower bearings. These are what I use for cam followers on some engines I build. I've never used a powered wood splitter but I would think that too thin an angle on the wedge would run the risk of it "sticking" in the wood. A larger angle would force the wood apart more and it's that action that forces the split to propagate along the log. If you split a piece of wood with a wedge you'll see that the separation of the two pieces is happening well ahead of the point of the wedge. It's likely a problem the solution of which depends on the splitter kinematics and the wood type and condition. An experimental approach is definitely indicated. Is the edge of the wedge going to lean out at the top to force the log to stay on the splitter as well as making the entry of the edge into the log progressive to reduce the force needed? Do they sell balsa dowels? Brian, I know you are going to think I'm full of crap ( think, you already know ), but, I was thinking about your sawmill just the other day and thought wonder if he has thought about a splitter. I like the route you are looking at now. I agree with Marv, after using one a good bit, I notice the least bit of an unsquare cut on the log and it wants to rise. A wedge with some rake on it may just solve this and I'm probably going to try it in full scale. Thanks for the DR video also. To me it seems they have built a machine using very old technology with modern power. 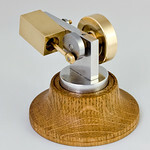 It seemed strange to see two big spinning flywheels on a modern piece. Replace that engine with a stationary ( with fly ball govenor ) and flat belt and let it bark. The links and activation arm are all sussed out. The yellow bearing support plate and flywheel that fit on the near side are hidden so you can see the linkage. About all that is left to do is model in the return springs for the ram. Brian, other than just adding another movement, I think it would work with the roller just placed into the " activation arm". The operator is going to have to hold pressure either way. Not so, Eric--It is a "cam over" arrangement, and locks in the forward position when activated until the end of stroke is reached. Well---maybe not. I just watched the video again and he does have to hold the handle. Perhaps it's just set up this way so that he doesn't have to hold a lot of pressure on the handle.--I see that there is an adjustment bolt, so it probably could be adjusted to be a cam over style, but that would contravene a whole ton of safety and liability laws. Will there be a type of trip to unlock the rollover on the cam at the end of the stroke or will the operator do it? So there we have it, return springs and all. My software counts a total of 21 parts. 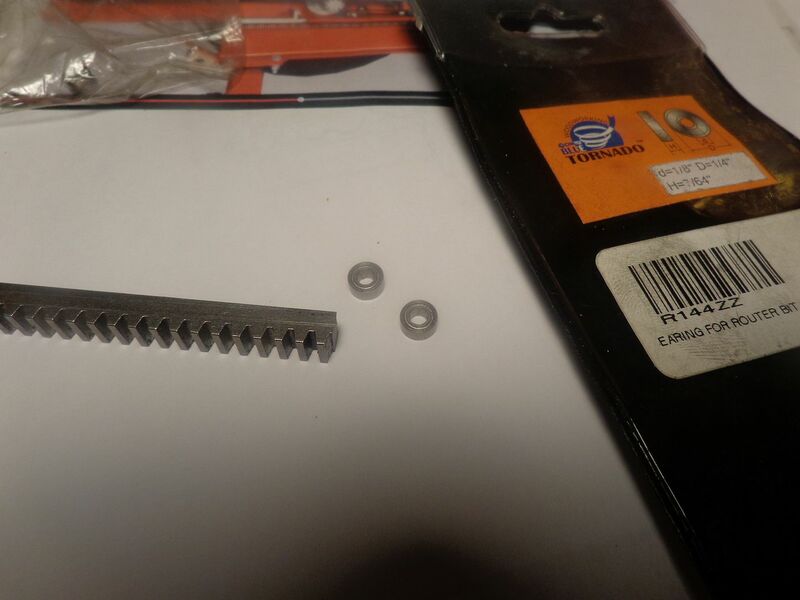 2 of those parts are the return springs, and two are the flywheels which I already have, one is the rack which I already have, and two are the router bearings . That leaves 14 parts to be fabricated. 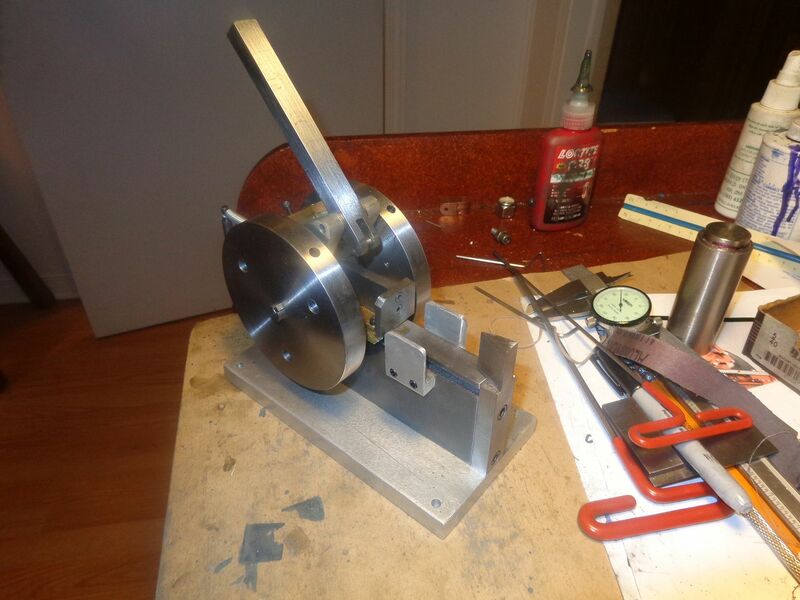 The flywheels aren't really wide enough for a belt drive at only 1/2" wide, so I might have to think about a pulley. 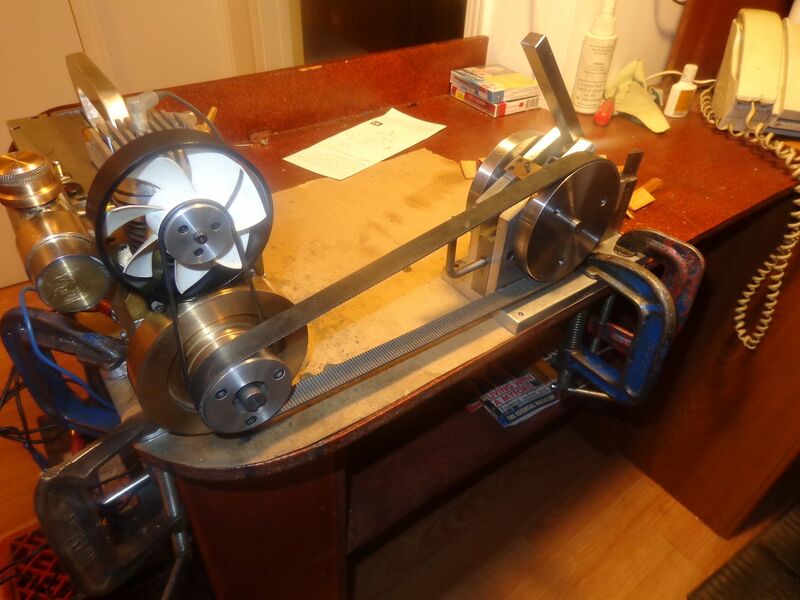 I would like to have my flywheels turning at 300 rpm, and the powerband of my engine is at about 1200 rpm, so if I could drive it to one of the flywheels with an o-ring drive with the 1" diameter pulley already on the Webster, that would work out perfect. Yes, there will be a trip to disengage the rack from the pinion at the end of the stroke. The springs will pull the ram back into the home position. Eric--Go back to post #9 and watch the video--all of the action is very visible. All of the modelling is completed. 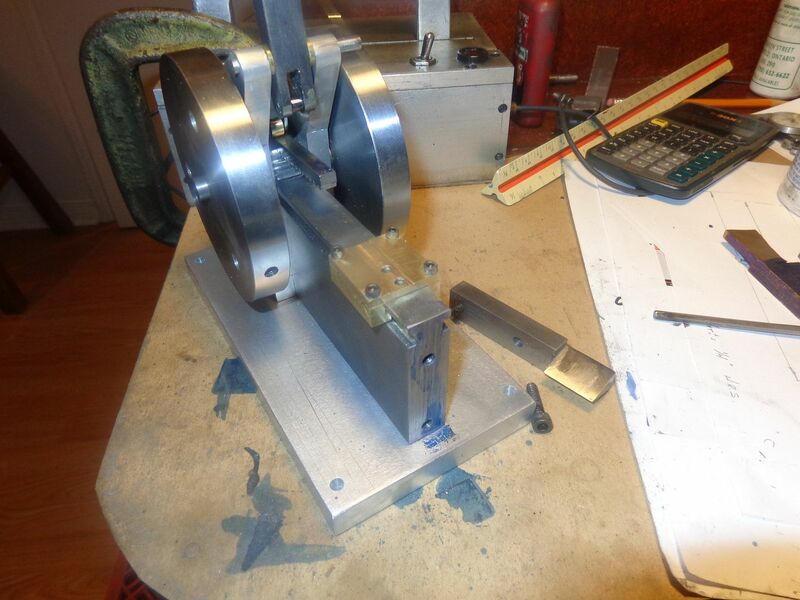 Bushings have been added to the bearing plates, keyways to the pinion shaft and flywheels, and a stop bolt assembly to adjust the swing of the engagement linkage. Also, a cross dowel has been fitted through the main support body to limit the back travel of the rack and pusher assembly. 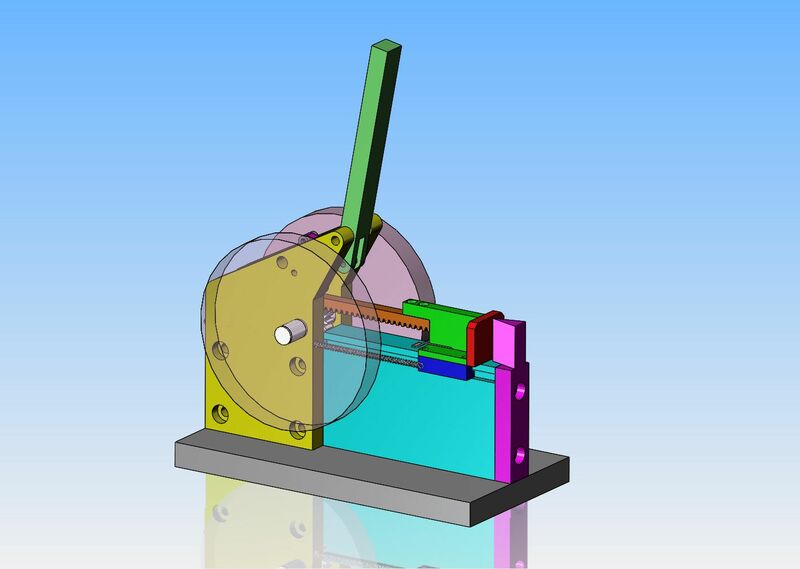 In the current view, the handle is in the engaged position and the router bearings are pressing on the flat back side of the rack, forcing it down into engagement with the pinion gear. I think perhaps the most interesting part of this build, for me, will be the linkages. Most of the plates, etcetera are just basic shapes with clearance or tapped holes in them. 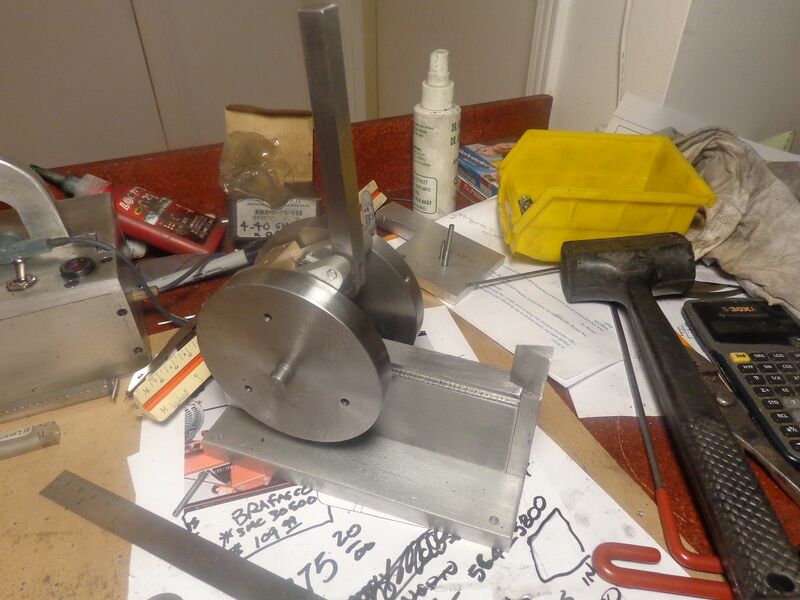 The gear is complex enough if you haven't made two dozen gears already on other projects. The links are in a way, new ground for me to cover. This particular link will be made of steel. The only trick part may be turning the bosses. Again, the standard warning applies about these drawings--Do Not Copy them!!! There may be errors that I won't discover until later in the build. All drawings will be updated, and a download link provided at the end of the job. Brian, how will the rack be returned to the "open" splitting position? I see you mentioned return springs, but what allows the rack to move upwards to clear the pinion? Is the "pusher" able to rotate or move upwards to disengage? Yow!!! I'm glad there are only a couple of links. This is too much like jewellry making for me!!! John--You have to watch the video in post #9---I am trying to make mine exactly like that.--Yes, it does pivot up. This is just so NEAT!!! I didn't really trust my layout, and didn't want to make the rather complex bearing support plates until I had actually built and checked the pivot points for my linkage mechanism. 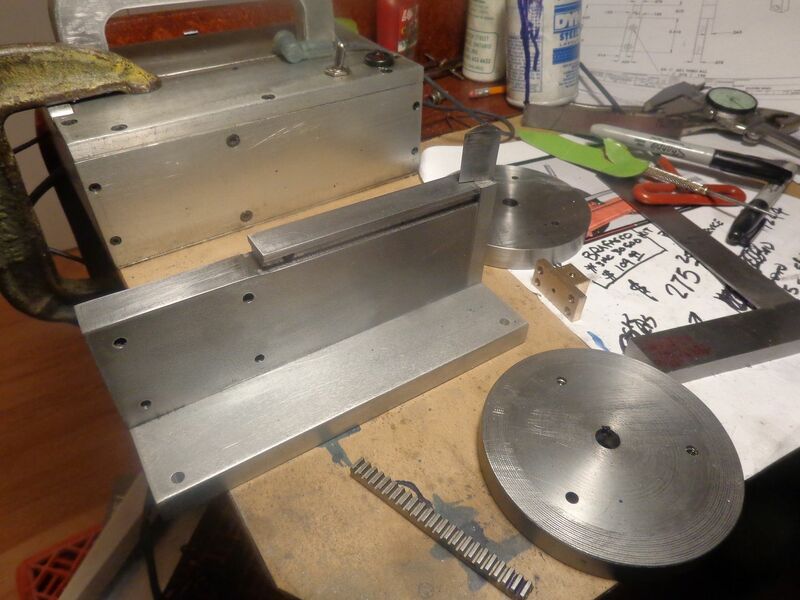 I layed out the position of the pivot holes in a scrap piece of plate and loctited the pivot shafts into place, as well as one extra round piece to act as the "travel limiter" which will be adjustable in the finished version. 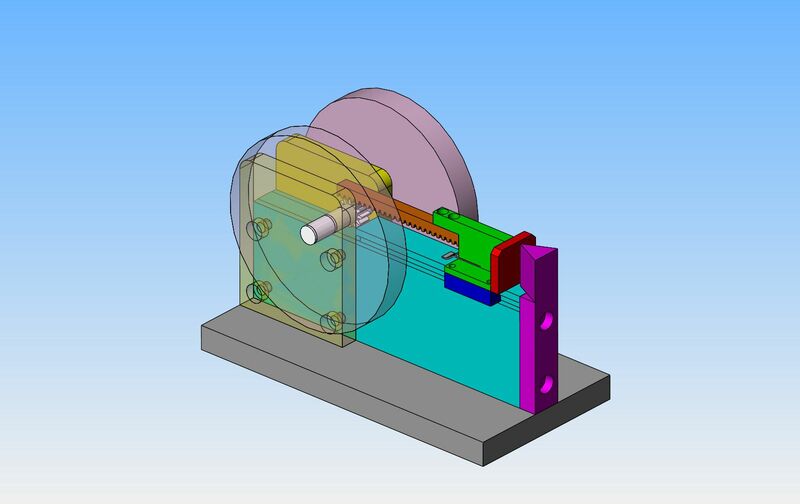 When the handle is pushed to the right in the "engaged" position, the two router bearings are riding against the back side of the rack and holding it in contact with the rotating pinion gear which sets below it. 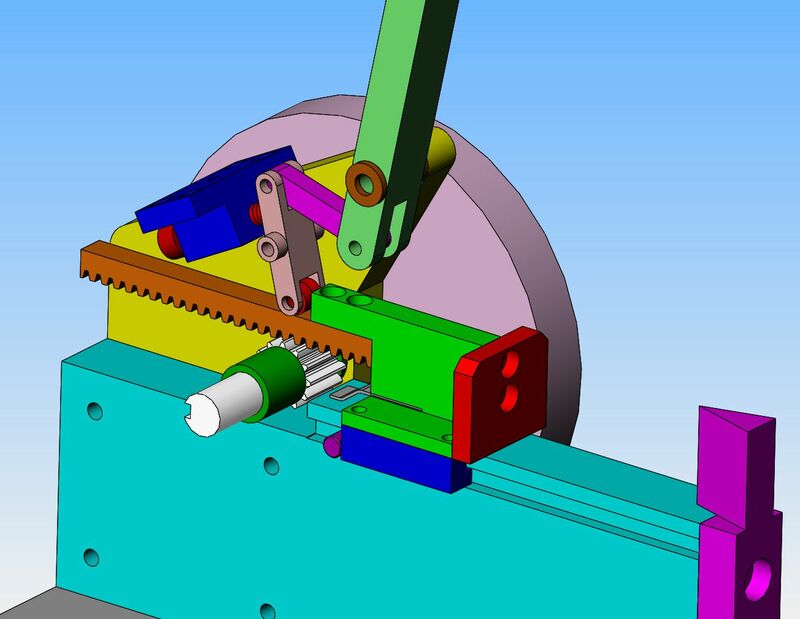 As I had planned it, the linkage is a "cam over" action, and in the position shown, no amount of upward force on the rollers can make the linkage move into the "disengaged' position. 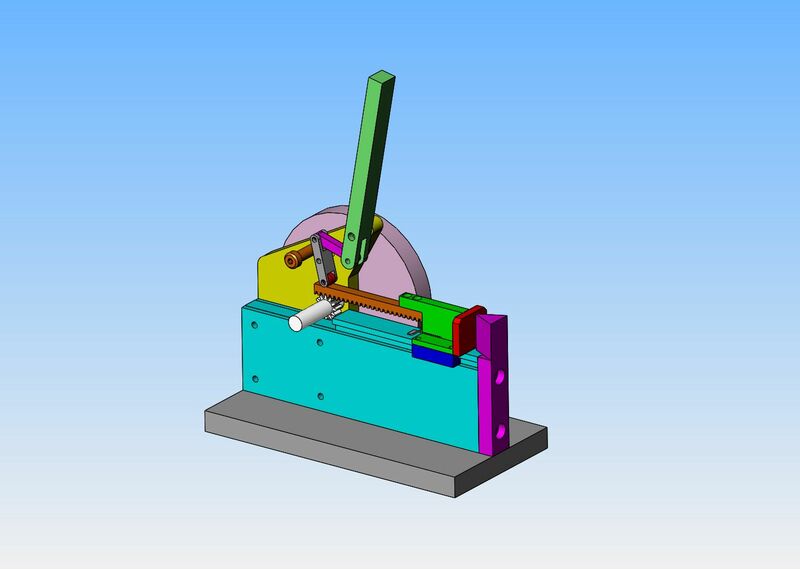 When the handle is moved to the left, into the "disengaged" position, the rollers lift up about 1/8" from the back of the rack.---The rack will be spring loaded from below to move into the "up" position against the underside of the rollers. 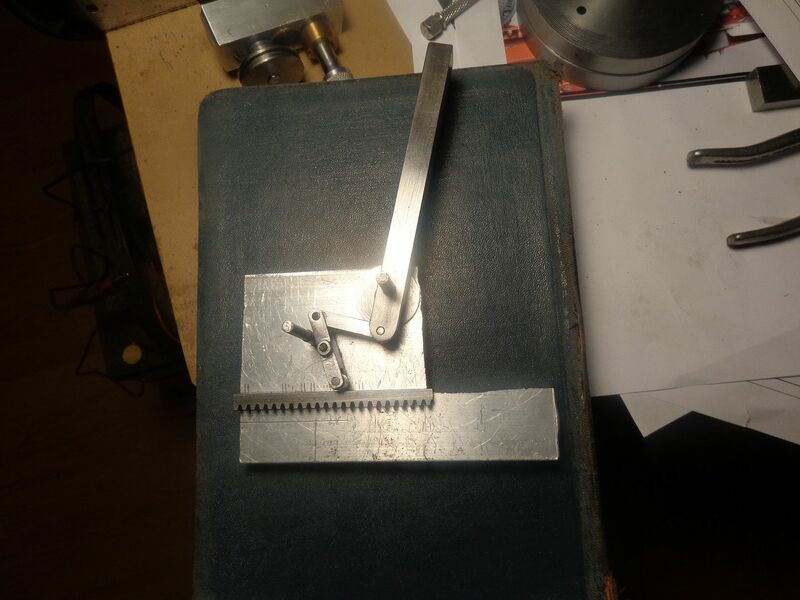 That is the amount it needs to move to disengage the teeth of the rack from the pinion gear, so that the rack and "pusher plate" can be pulled back into the load position by a pair of tension springs attached to it. Note that in my "disengaged" arrangement I haven't moved the rack up, so you can see the gap between the back of the rack and the rollers. In normal operation, that gap will never be there---the rack always stays in contact with the rollers. This is what it looks like when the rack is disengaged and fully retracted. the rack and all that it is attached to pivots on the right hand lower edge of the red pusher plate, and is pushed up into that position by the grey leaf spring, which slides along the top of the main body. 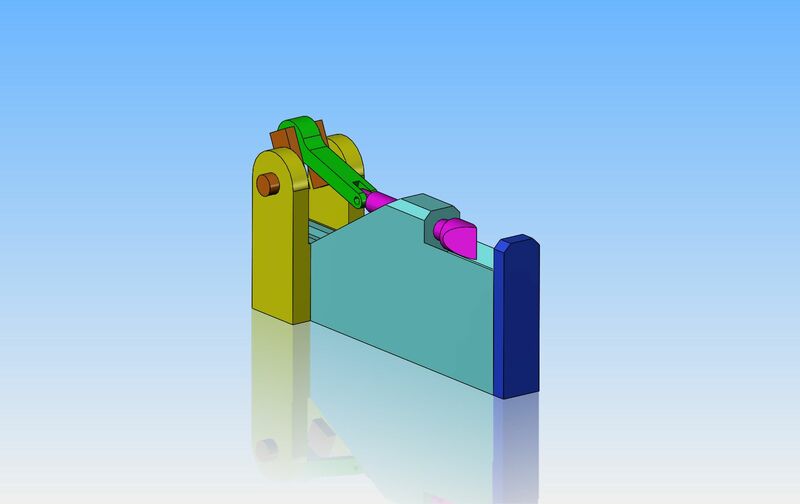 the blue adjusting block with the red bolt through it acts as a stop for the bottom link so it doesn't go too far back. I will probably have to turn some off the diameter of the head of the adjusting bolt for clearance from the back of the rack. The only thing I'm not 100% sure of is that there is a bit of voodoo going on at the "free" end of the rack. In the video, the free end of the rack has a sharp angle cut on it. I know why--the entire handle is held in the "cammed over" forward position by the grey leaf spring pushing up on the rack. As the rack gets very close to the end of its stroke, the flat leaf spring pushes the angled part of the rack up against the rollers, forcing the entire linkage to flip over into the "uncammed "retract" position and let the rack jump up out of contact with the pinion gear. I may have to figure that angled cut on the end of the rack out after I get everything assembled. I had a nice peaceful morning, and found a scrap of bronze to machine the adjusting bolt holder from. Then I went down town to my steel suppliers and bought all the material to finish the woodsplitter. 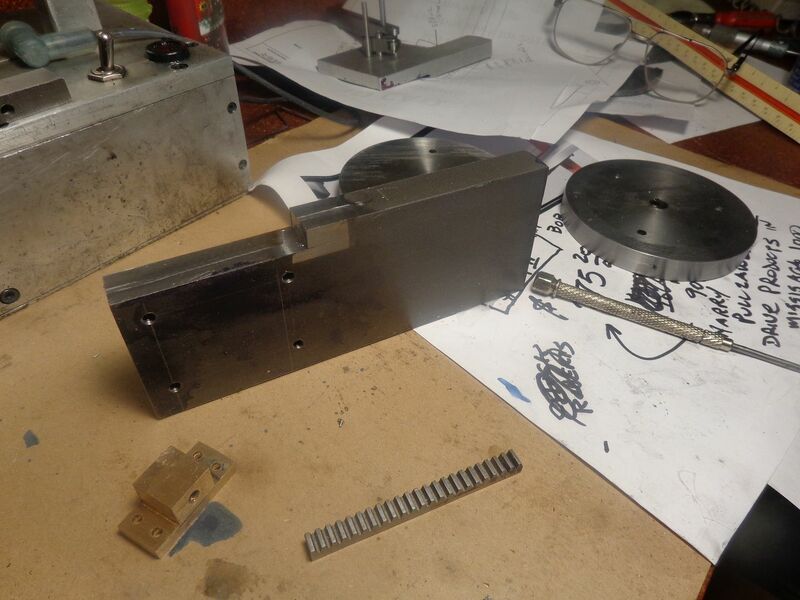 I decided the main body should be made of cold rolled steel because of the pusher sliding along it. I bought the correct size piece, squared it up, then cut the big notch in it, and almost immediately I realized I had cut the damned notch 1/2" too long!!! I continued on, tapping 10 holes and wondering how I could have done such a stupid thing. when I was finished on the mill, I made up a piece slightly larger than the area I had cut away in error, V-d the edges, and took it out into my main garage to my "stupid mistake undoer" (some people call it a mig welder)and welded the piece back in. Then some clean up on the mill, and nobody knows about it but me!!! You know what they say sh!t happens, at least you had the mistake undoer. Then some clean up on the mill, and nobody knows about it but me!!! How does this model's ram force compare with your estimate of that of the full sized version? It seems to me that the stored rotary force won't scale well and you may need some kind of fudge to get the ram to work with anything beyond balsa wood. 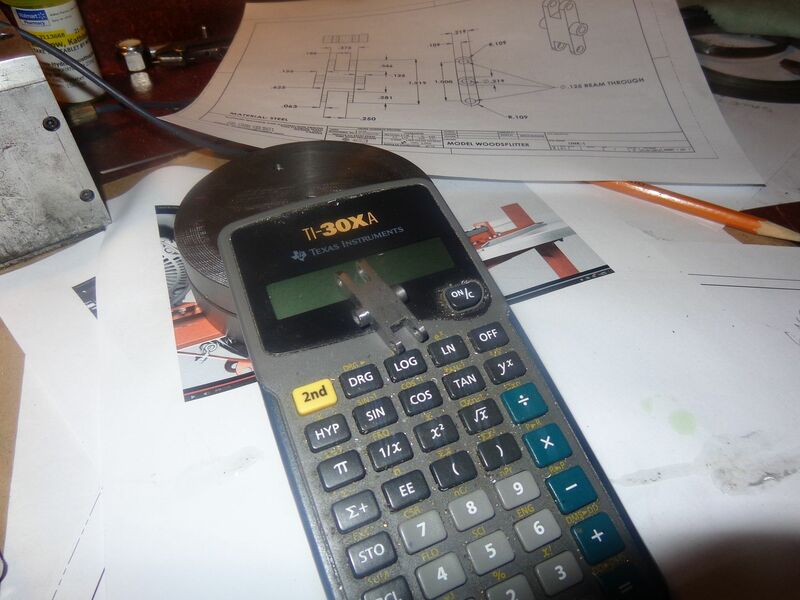 Does your CAD software allow kinetic analysis of this kind of issue? If so, how do the numbers work out? That's enough silly work for today. Everything fits so far. There are some interesting set-ups in that splitter head!! Well Dang!!! Ya gotta just love that!!! I just got some real work in so will have to discontinue for now. 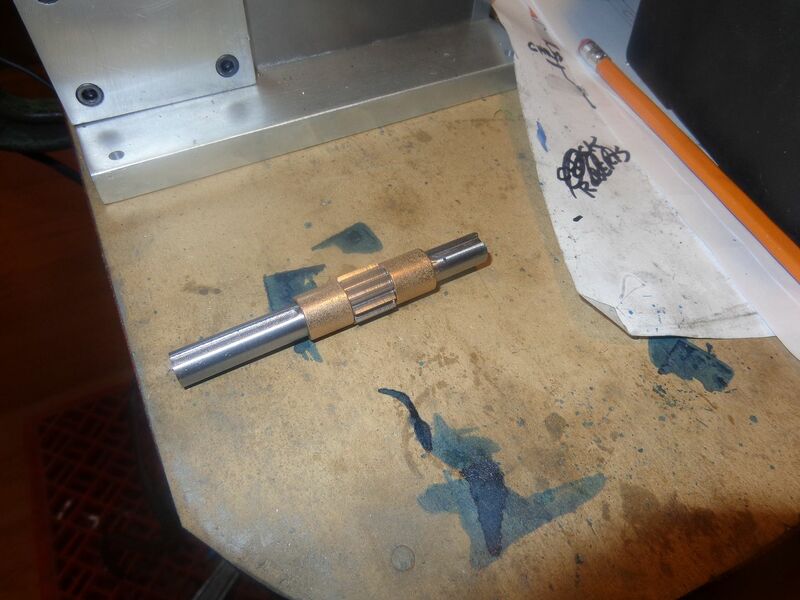 Now, if I just had 12 teeth cut on this baby, the pinion gear/driveshaft would be finished. The gear is so small in diameter that I didn't even think of making it a separate piece. I agonized over whether to make it out of cold rolled steel, 01 drill rod unhardened, or 4140 steel, because I am worried about the teeth shearing off. 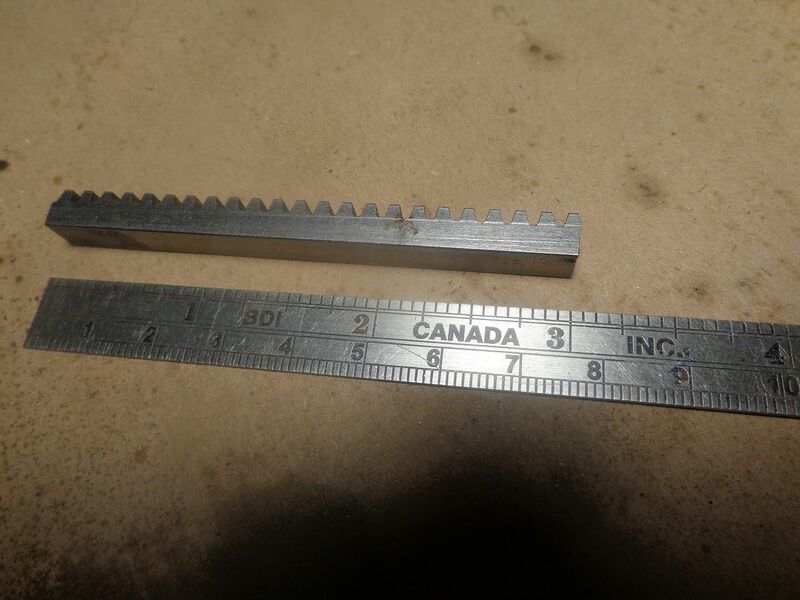 This morning I decided to go the cheapest route first, because I already had some 5/8" diameter cold rolled, and I am afraid of cutting any material harder than cold rolled steel because I don't want to wreck my smallest gear cutter. They cost me close to $70 each!! I may get the teeth cut this afternoon. That went well!! The gear is cut, and I didn't end up with any "half teeth". Both ends have the keyways cut, although it's a bit hard to see in the picture. It mates very well with the rack---(I tried it as soon as it came off the mill.). 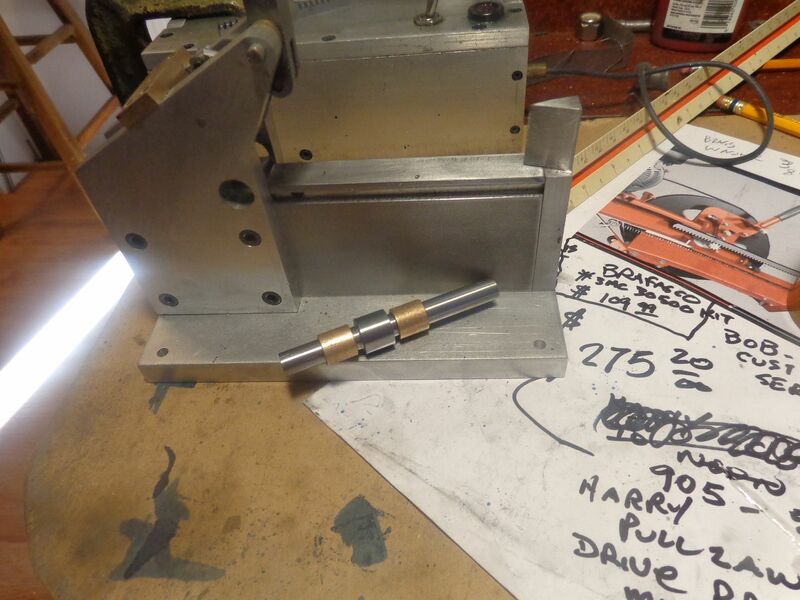 At the last minute, when I was making the shaft this morning, I decided to make the shaft 3/4" longer on one end, just in case I have to mount a pulley instead of running my drive belt to one of the flywheels. Now that I have reassembled everything, I can actually try it out. If I spin the flywheels by hand, feed the rack in from the back end, and immediately move the lever into the "extend" position, it grabs the rack and spits it out the front side like a lightning bolt!! :eek::eek: It doesn't seem to do any "grinding" of the gear teeth at all, as near as I can tell. This is good news, so far. We have an all bronze slider finished. Holy Cow---There are only a couple of pieces left to make!!! Check this out. This is just too cool!!! Before anybody points it out---The "pusher plate" will not extend far enough to run into the splitting wedge when I get everything finished and in place. It will stop about 3/8" from the splitter plate. After giving this some though, I have decided that this lovely little machine would chop fingers just as easily as it will chop wood. The "logs" are round and will have a tendency to roll off the splitter before they get split, and I don't want my fingers grabbing for a log trying to straighten it out and "whoops"--there goes the tip of my finger!!! To that effect, I have designed a set of log racks that will keep the log from falling off the splitter before it gets pushed through the splitter wedge. The wood splitter is finished!! The log racks that keep the piece of wood from falling off before it gets split got a little simpler. The dual springs which return the rack to it's home position were scrapped in favour of a single tension spring that returns the rack. Now all I have to do is hook it up to one of my engines and see if it really splits wood. I want to see what happens when you drop an (unshelled) macadamia nut in there. Here ya go boys and girls. This is fun!!! I hope you enjoy the pictures of my old bald head while I am picking up wood off the floor. If anybody wants a complete set of drawings, email me at brupnow@rogers.com. Marv--Not without my suit of armour!!! Luc--Since you mentioned o-rings in an earlier post, I thought I would post this for you. This is one of the few times that I didn't use an o-ring to drive one of my "creations".---Not because I couldn't have, but because I didn't want to cut a v-groove in the face of one of my flywheels. This "rubberish" flat belt drive with the corrugated inner surface is 5/8" wide x .093" thick, and grips like a tiger on a flat pulley. There is a vacuum cleaner repair place not too far from where I live, and occasionally I go down and root around through their scrap bin to see what goodies I can salvage. That is the origin of this flat belt. Surprisingly, their isn't much feed-back from the splitter to the engine when I split a piece of wood. The engine doesn't even falter. The inertia of the two steel flywheels on the splitter is doing all of the work. Probably an o-ring would have worked fine, but it would have been difficult to keep on the flat pulley. Very cool Brian! That works quite nice! I love the log splitter. I think we're all smiling. Thanks! Hugh. Looks good Brian, would make a good nut cracker too. I was quite surprised by the speed of the woodsplitter, having seen videos of some of the full sized units and how they inch so slowly. My mistake was to think that yours was going to move fairly slowly too. 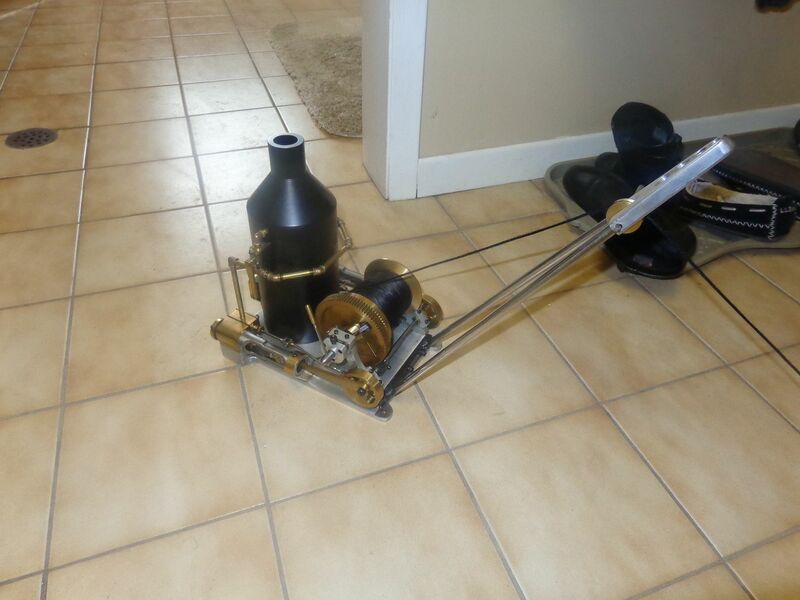 It certainly makes a nice addition to one of your engines, all you need now is an automatic "log" feeder mechanism and you'll be all set for a fascinating display at any model engine show. I'm having a bit of trouble believing that "the inertia of the two steel flywheels on the splitter is doing all of the work." Maybe I'm misunderstanding but doesn't the engine remain attached to the flywheel while the ram is moving through its stroke? If that's true, then the engine can deliver power to the ram throughout the stroke. If you spin the flywheels up to the approximate speed of the engine, say with an electric drill, and then detach the drill, will the device still split a chunk of broom handle? Marv--If there was a lot of feedback to the engine when the splitter was actually engaging the wood, the drive belt would jump. Watch the video again. Keep a close eye on the drive belt. It doesn't even twitch when the splitter is doing the actual splitting. Somebody asked the other day what I used to skid the broom trees out of the closet and over to my sawmill/buzzsaw/woodspliter. Well Jeeez!! !---Of course---I use my donkey engine/winch. Page created in 0.706 seconds with 19 queries.